“Spring equinox” seems like a fitting contest prompt, seeing as we’ll be taking a little hiatus from the weekly contest: change and renewal. Beautiful entries this week — enjoy! Our winner is Rebecca Coll. Rebecca writes: “As soon as saw what the prompt was for this week, I knew exactly what I was going to do… a dos-à-dos binding. 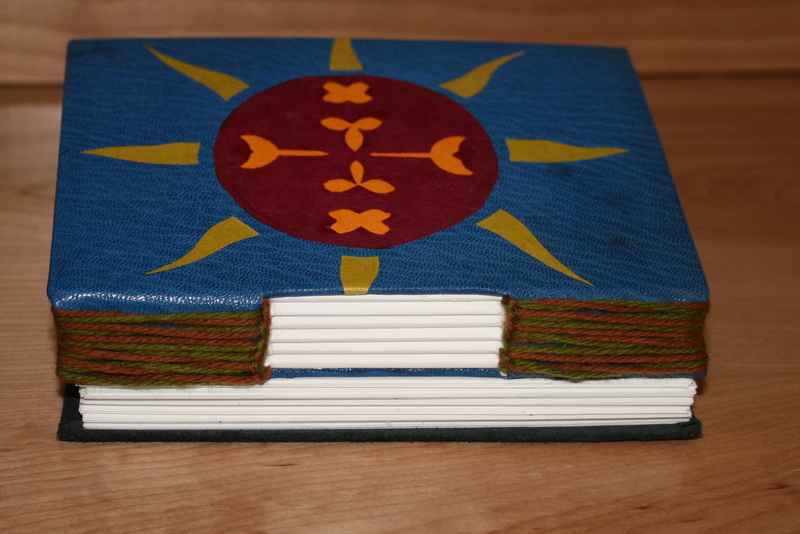 This is a particular bookbinding technique that binds two books together with a shared ‘back’ cover. The two books are therefore both individual and half of a greater whole, much the same as the equinox: equal night. Half night, half day. Following are photos of my equinox-inspired dos-à-dos journal. Two books, each with six signatures (sections) to represent the six months from equinox to equinox, bound together to make one year-long diary. Each signature has 32 pages, which is approximately one page per day (you have to have multiples of 4 when bookbinding, so I couldn’t get the math to work out perfectly). Both ‘books’ are bound in leather with bookcloth onlays and the spines sewn in a button-hole technique using both green and brown cord — for spring and fall. 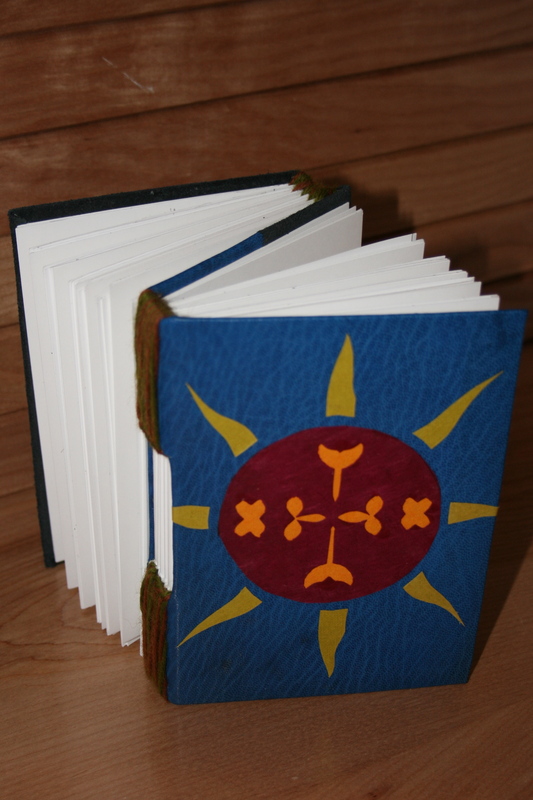 The vernal equinox book is in blue leather with a colorful graphic depicting spring. 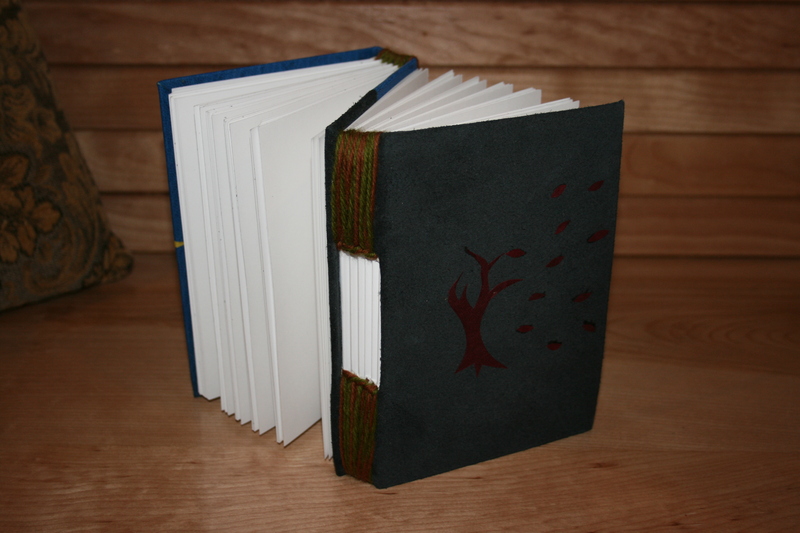 The autumnal equinox book is bound in black suede (leather glued on backwards with the ‘soft’ side showing). The cover of this book shows a tree having lost it’s leaves. Together with both books one can record a year’s worth of memories: equinox to equinox.” Wow, is all I can say, Rebecca! An absolutely brilliant interpretation of the prompt. Your $10 amazon.com gift certificate has been issued. 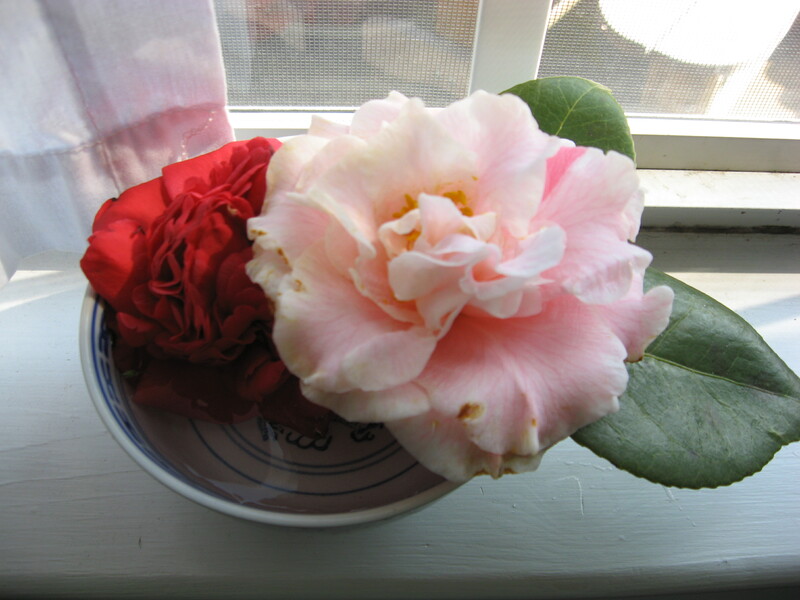 moved the blooms to the Equinox. This weekly contest has been a real pleasure, everyone. Please keep those creative juices flowing, and don’t feel shy about sending your creative endeavors in for posting. We love random acts of creativity! 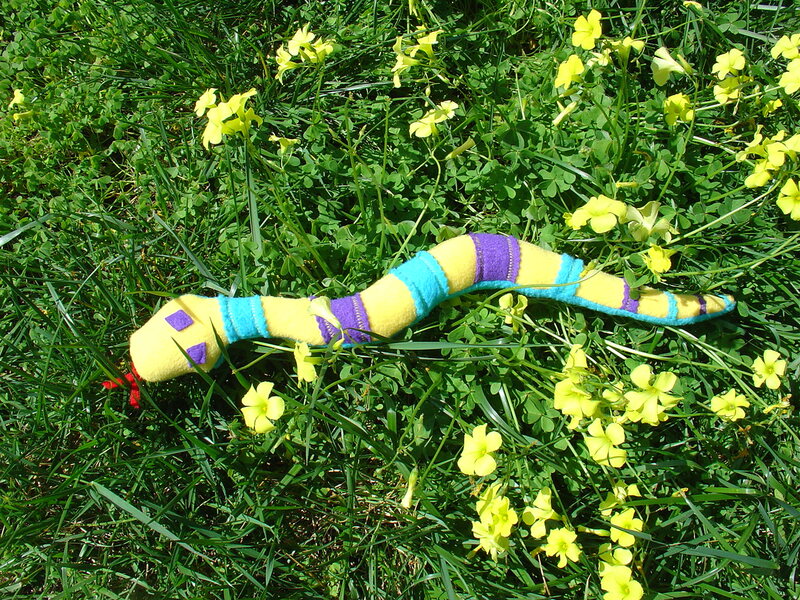 this is a fitting end to the contest, as spring is about renewal and change and growth, shedding the old for the new, the chrysalis for the wings, snake skin…feeling a little sentimental…. rebecca, what complex thought, vision and production you brought to the equinox! such fun! 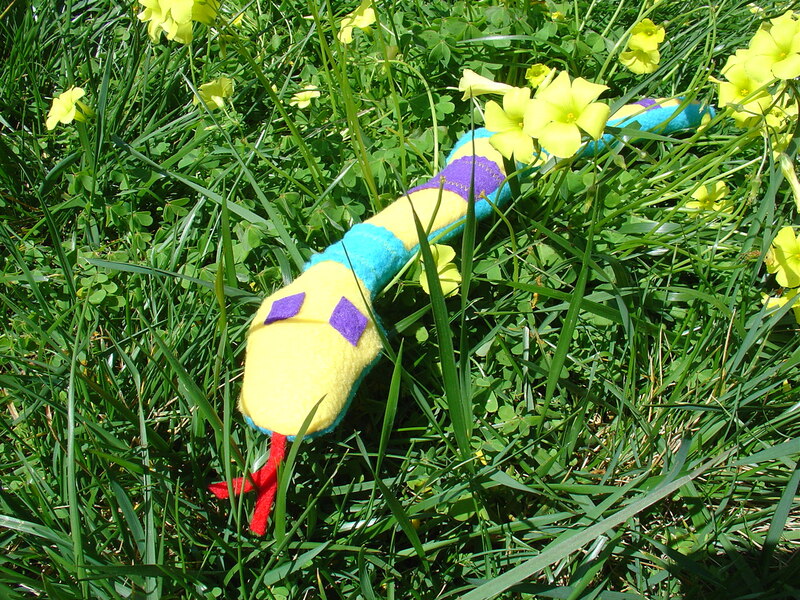 jen, the snake is adorable…thinking of a new product line? or cpsa regs still a craw? i bet bj will love her, and rename her stuxey III. congrats rebecca! your book is fascinsating, particularly the way the two pieces fit together. Thanks for the kind words Cathy and Kelly. It was a fun prompt to work with… And thanks Miranda for all the inspiration, week after week. Enjoy your hiatus. Congratulations, Rebecca! What a fantastic entry. Bookbinding is on my (ever growing) list of crafts to explore someday… you’ve clearly mastered this! just stunning. 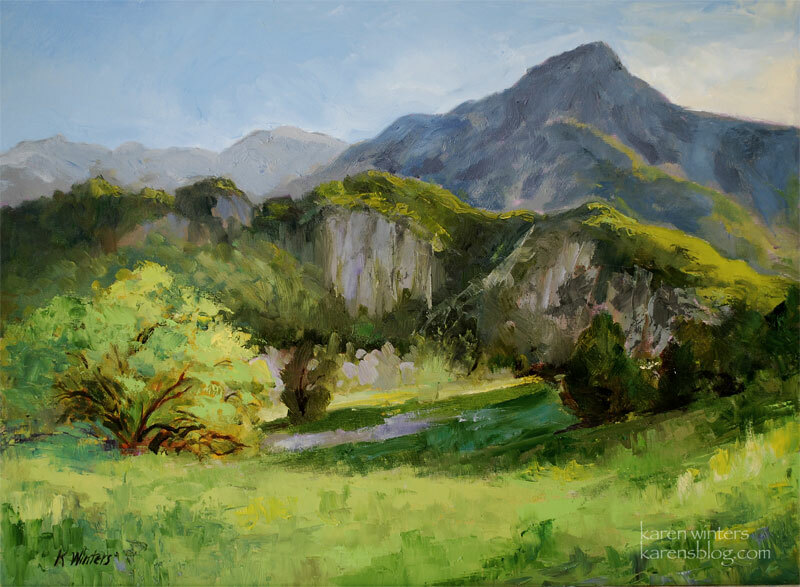 Beautiful painting, Karen — love all those lush greens! karen, oops! i love the glowing green in the landscape and the geology/weather lesson which explains the temporality of it that goes beyond the usual spring temporal nature. your landscapes are always a pleasure.